Are Georgia’s diners better off today than they were a year ago? That slightly revised campaign slogan is what I weigh each year as I sit down to write our annual Silver Spoons story. As in nearly every other sector, restaurants’ business climate has been dismal since 2008’s downturn, and recovery has been slow. Still signs of progress – often away from the old notions of Grand Dining and toward better-quality food even in humble burger shops – have sprouted every year. This year, there could be no more appropriate or telling new restaurant name than The Optimist, in Atlanta’s hip frontier, west midtown. Significant casualties continued to mount, including, sadly, the last outpost of the Kinjo brothers’ restaurant empire, MF Buckhead. That cavernous, glitteringly upscale sushi palace, complete with a private omakase room, was one of Atlanta’s last great expense account indulgences. (Although expensive, MF Buckhead was an excellent value, with breathtakingly fresh and creative cuisine in a stunning environment.) Nava, the Buckhead Life Group’s Southwestern offering, crowned Buckhead’s busiest intersection for many years after that menu trend declined, until it closed in August. Despite their high quality, both restaurants seemed to represent another era, one that has given way to something both slightly more downscale and more exciting. The Optimist is just one example of the boom in Atlanta, and to some degree, elsewhere around the state: Chef Ford Fry of JCT. Kitchen has upped his entrepreneurial game with this rehabbed former warehouse, with one of the tastiest and most spot-on formulas around: A non-slavish focus on local and regional ingredients means the menu is gently Southern, family-friendly and just plain fun. It’s one of several spots to bring life to formerly desolate intown locations. Like Lure, just off Midtown Peachtree, a new fish-centric branch of the Fifth Group (Ecco, South City Kitchen), it also lists cocktails and oysters as mainstays. Then there is The Spence, Richard Blais’s new place near Georgia Tech, featuring – yes – cocktails, oysters and a lot of fresh local fare, although with Blais’s trademark creativity, and helped along with liquid nitrogen (read: ice cream, smoke, foam). In Athens, Hugh Acheson’s Five & Ten prepares to move, as his midtown Atlanta Empire State South continues to be the city’s pioneer and high water mark for the same basic ingredients. This year, Acheson won James Beard Awards for both the Best Chef/South-east (in a tie with Restaurant Eugene’s Linton Hopkins), and for his cookbook, A New Turn in the South. Like many zealous believers, Acheson is a convert – a Canadian who has embraced Southern food as the story of America’s agrarian past, present and perhaps future. One of the most interesting developments in food nationwide is happening in that foremost food city to our east: Charleston. Chef Sean Brock of McCrady’s, until this year the third chef in a row from that town to win the James Beard Award for best Chef/ Southeast, opened a restaurant that has thrilled national critics while spurring a hot local debate. At Husk, you’ll find fabulous cocktails, oysters and hams, but also such seemingly mundane dishes as pimento cheese, fried catfish and cracklin’ cornbread, prepared with the care, skill and prices of the most revered cuisines. Husk may well represent an opening shot in the battle to make truly, uniquely Ameri-can food as respected as our many European imitations – as important a cultural contribution as jazz is to the world’s musical lexicon. For most, “American” food will turn out to be Southern: fried chicken, cured ham, bourbon, corn meal, gumbo. Already, in New York, Southern food is finding its way into hip Tribeca spots, as well as atop the artsy, boutique Gramercy Park Hotel. Perhaps it’s fitting that here in Atlanta, the Southern influence is slightly more muted than Charleston’s, the environment a bit more cosmopolitan – we are, after all, still a crossroads. Fried chicken seems destined to be this year’s version of the grass-fed burger craze: Shaun Doty of Yeah! Burger and the late Shaun’s has two upcoming restaurants dedicated to the gospel bird: Chickabiddy and Bantam & Biddy, and Chef Suzanne Vizethann’s Buttermilk Kitchen in Chastain Park will have a regular Tuesday night fried chicken supper. All will feature the chicken our grandparents served – that is, not mass-produced in factory farms. Kevin Gillespie is leaving Woodfire Grill on Jan. 1 to open a locally sourced restaurant with a certifiably Dixified name: Gunshow. And at press time, we learned that Fry is aiming to open a new restaurant in the old Nava space by January. The concept? Rustic, early American fare. Not every bold attempt is working as well as it should – the menus at both the new Watershed in Buckhead and The Windsor Hotel restaurant, Rosemary & Thyme, in Americus, need serious tweaking. Still, those are ambitious efforts at reinvention, signaling a serious optimism. However, the most exciting trend in town – and beyond – is the newfound respect for a cuisine crafted on, and borne out of, red clay. Prescient. Cliff Harrison and Anne Quatrano moved to west midtown Atlanta and pioneered the use of local ingredients (including some from their own farm), before anyone else envisioned that industrial area as a mecca for creatives. Their dining room is a longtime Atlanta favorite for celebrations, and you can still nab a last-minute seat at the bar for one of the best meals in town. 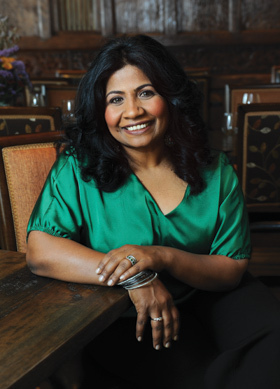 Chef/owner Asha Gomez accomplished two things by opening her pretty, serene spot: Supplied Atlanta with a hip, upscale Indian restaurant and introduced diners to the meaty, complex cuisine of her native Kerala. The source of Hugh Acheson’s grander, bigger restaurant vision (see Five & Ten, below) is still very recognizable – it’s an adventure flick based on his own first novel. The large, airy rooms and big crowds give the place an energy and pizazz you won’t find at his quieter outpost. Acheson’s focus is so singular it borders on eccentricity – but it’s the fun, gentle kind. Familiar Southern flavors form unexpected alliances in Acheson’s kitchen, but you’ll also find a rare devotion to fresh heirloom vegetables in ways you never thought of. On its own, Greyfield really isn’t a destination just for the food. But it is a big component of this utterly unique place, whose main draws include its incomparable beauty and solitude among historic ruins, dunes and wild horses. You dress for dinner, much of it from local shores and Greyfield’s own garden, and sit with your fellow guests – a fascinating group from near and far. It’s worth noting that Greyfield’s nightly room rate includes all meals for two. The facade facing Abercorn is easily overlooked, so drive around back to nab a seat on the cool patio. Enjoy handmade pastas, wood-grilled fish and the extensive wine list. A Hawaiian restaurant in Carrollton, complete with tiki bar? Chef Tano Phommasith, a Hawaiian native, and wife Cristi, his manager and hometown girl, make it happen, with Southern-friendly sweetness. An exciting example of the latest crop of talented restaurateurs crowding into west midtown, with the mandatory formula of oysters, cocktails and local/regional ingredients in a beautifully rehabbed space. Known for big flavors and big crowds across his restaurant empire (Rathbun’s Steak, Krog Bar), Kevin Rathbun has stayed true to his “American regionalist” vision, serving up dishes influenced by the Midwest, Northeast, Southwest and, of course, home. At press time, he prepares to open KR Steakbar in Peachtree Hills, featuring “small-plate steaks.” The flavors will still be big. Linton Hopkins finally got his due with a James Beard Award (see story, above). With his more casual cafe, Holeman & Finch, next door, he delivers a one-two punch that starts with the best cocktails in town and follows through with emphatic, masterful technique using the best Southern ingredients.